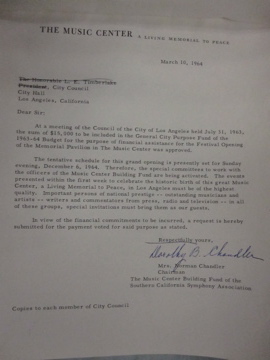 Letter from Dorothy Chandler to the L.A. City Council, March 10, 1964. Courtesy of the L.A. City Archives, Council File 113122. For Dorothy Chandler, the Music Center was a means to an end. Without a doubt, Chandler truly appreciated symphonic music and had loved the performing arts since she was a child. She wanted to see the L.A. Philharmonic installed in a permanent home fitting for an orchestra of high artistic caliber. And she was a passionate and competitive person who wanted to make her mark on Los Angeles. Her commitment to the Music Center was unwavering. At times, she referred to the project as her baby. In a letter to a friend, she remarked, “My pride in the Pavilion is overwhelming. It far exceeds in every way what I had envisioned. I believe that its impact on our city of the future will more than justify every effort and each donation in its creation.” Clearly, her total dedication to the Music Center project went far beyond her personal interests. Chandler knew what the Center’s construction would mean for downtown, and for Los Angeles as a whole—that Los Angeles indeed cultivated a vibrant musical and artistic community, and it was time the rest of the world recognized it. Writing of the Los Angeles Music Center in 1975, journalist and author Leonard Gross wrote: “No single act has ever done more for a City…physically it provided a desperately needed centerpiece to the city, a statement of quality and identity and an inspiration for bold growth. Its impact on the Southern California psyche was fundamental; it gave pride to a city that, until recent years, had all but apologized for its existence.” While his statement was an exaggeration, the author got it right that the Music Center gave pride to the city and its residents. “Brightness in the Air,” Time Magazine, December 18, 1964. Edward Carter quoted in ibid. Marian Burke, interview with the author, March 12, April 1, 2010, Los Angeles, California. Harold C. Schonberg, “Worth What It Cost,” New York Times, December 13, 1964. Thank you letter from Dorothy Buffum Chandler to William Pereira, January 11, 1965, Box 8, Dorothy Chandler Papers, UCLA Department of Special Collections, Young Research Library. Leonard Gross, “Soul of the Center,” Westways (February 1975). Quoted in Margaret Leslie Davis, The Culture Broker: Franklin D. Murphy and the Transformation of Los Angeles, 76.